This is a great 58-page resource…to help you look at your blog objectively… and make it better! The Catholic Bloggers Network is an affiliate of Momcomm.com and any commissions received by your purchase of this awesome e-book will help to cover the basic maintenance of the Catholic Bloggers Network website. 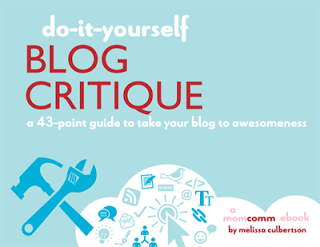 The Do-It-Yourself Blog Critique guides you through a comprehensive examination of your blog, addressing your blogging goals, design including fonts and photos and layout, navigation, functionality and content. Melissa Culbertson is the author of the newly released Blog Design for Dummies.